My cat Sunny is thirteen years old, he is a Silver Persian. I put his brother down and brought Thome a tabby Persian who is now seven months old. 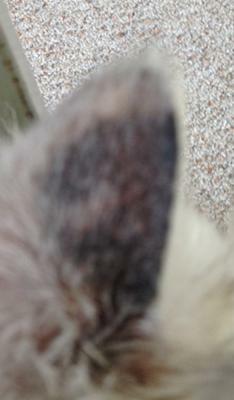 Sunny was diagnosed with ringworm almost a month ago; his ear suddenly turned black and was scabbing on the outside. He has been on Micazole which eliminated the scabbing type hardness but how do I tell if it is getting better and is there more I should be doing. Ringworm can be a difficult condition to eradicate so you are right to question whether or not you are doing everything possible to get rid of it. If your cat seems to be improving on the miconazole, continue treating him until you start to see hair regrowing on the affected area. At this point, bring him back to your veterinarian for a recheck. I your cat were my patient, I would run another test for ringworm at that point and if it was negative, discontinue treatment and watch him closely for a relapse. If the ringworm does not respond to the current treatment of returns soon after it is discontinued, you might need to consider more aggressive therapy, like oral antifungal medications. I’m afraid there is a good chance that your new cat may have brought the ringworm into your house. To find out whether or not that cat is a carrier (and therefore capable of reinfecting your older cat or transmitting the disease to people), your veterinarian can perform what is known as a toothbrush test. This involves combing your cat’s fur with a toothbrush and then poking the bristles into fungal growth medium and evaluating anything that grows. If your young cat is a carrier for ringworm, measures are available (e.g., antifungal baths and dips) that can reduce the number of fungal spores the cat is shedding to the point where other individuals may no longer be affected. You should also decontaminate all the areas in your house that infected cats have had access to. Vacuum floors, rugs, and upholstery thoroughly and wash everything possible in a hot water and machine dry it on a hot setting. Use a one part bleach to thirty part water solution on any hard surfaces that won’t be damaged by it.